The year was 1971. It was the time of the hippies and the flower power generation. The hippies and other young people from Western Europe and the Americas were searching for Nirvana or Spiritual Salvation and Goa seemed to put them on the right track. The Goans also accepted these peaceful and gentle people whole heartedly. Life in Goa was simple then. No motorbikes, cars and restaurants. It was here and in this environment that Tito Henry De Souza who had travelled extensively decided to settle down and also provide a place for all the expats to meet up. 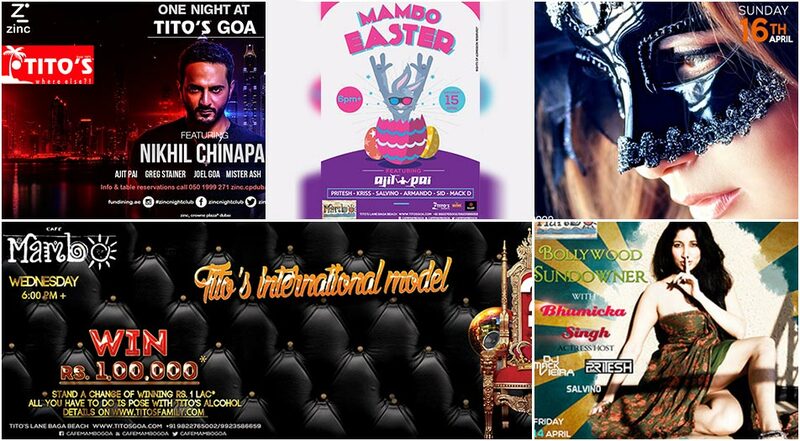 Easily one of the most recognised names among night clubs in India and a place where every DJ worth his salt plays at some point, Tito's in Baga is the favourite carousing spot for vacationers in Goa. The brand which has extended to Tito's Courtyard and Mambo is so famous that the entire stretch leading off the main road down to Baga beach has taken on the eponymous label Tito's Lane. Living up to expectations, Tito's nightclub provides clever touches, mirrors reflect fascinating images of the ever-throbbing clutch of people. The club with an entrance of its own has reinforced shatterproof glass walls to contain the sound of the music which is mainstream commercial. Come Christmas and New Year's Eve, 3000 revellers party between the two spaces. First add the event ticket to the cart and you will be redirected to the cart page. On cart page their is a option to enter your coupon code NEETABUS, enter the code and click on "APPLY COUPON" button.